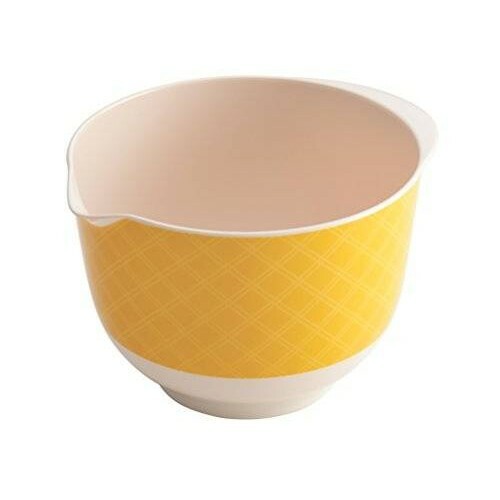 Stir up some fun, lively deliciousness with the colorful cake boss countertop accessories small melamine mixing bowl. Like all the great cake boss countertop accessories, the 1.8-quart Mixing bowl makes baking easier and more enjoyable for bakers of all levels. 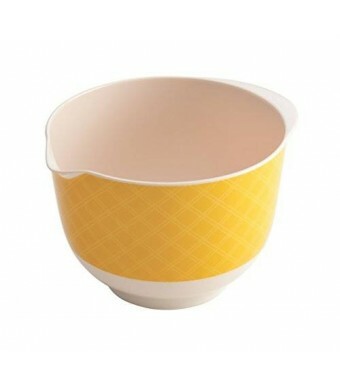 The bowl is constructed from durable melamine, and features a bright yellow diamond exterior and solid white interior. This handy kitchen accessory is perfect for holding dry and liquid baking ingredients ready to go, or mixing up a sweet batch of buttercream, because it is designed with a rubberized base for even more stability on countertops. And the bowl sports a helpful rim handle on one side and a pour spout on the other for pouring ingredients and sauces. The mixing bowl is conveniently top-rack dishwasher safe and complements other great cake boss countertop accessories and items from the cake boss collection.